Across the globe, March is observed as National Kidney Month. Approximately 10% of the world population is affected by chronic kidney disease (CKD). 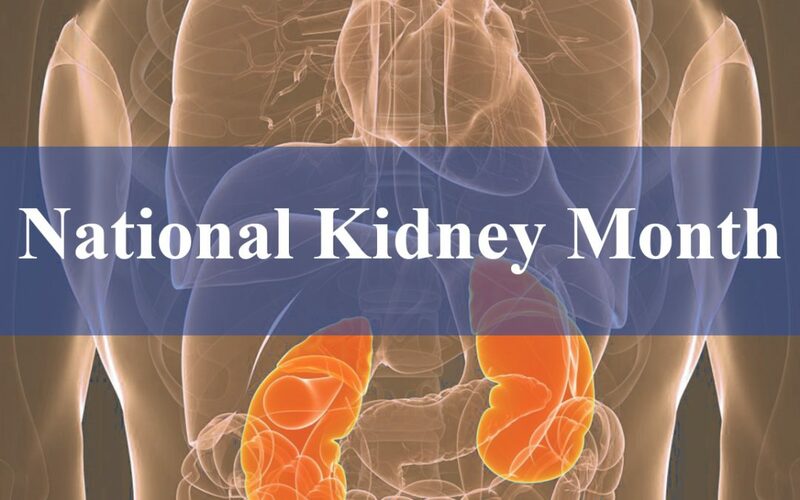 1 in 3 American adults is currently at risk for developing kidney disease and is the 9th leading cause of death in the United States with more than 590,000 people suffering from kidney failure. There are over 100,102 patients awaiting kidney transplants (as of 4/25/16), however, fewer than 17,000 people receive a transplant each year. Every day, 13 people die waiting for a kidney. Men with kidney disease are more likely to progress to kidney failure than women. The kidneys are two, fist-sized organs in your lower back. They maintain overall health performing functions like filtering of the blood each day. Removes waste and excess fluid. Control the production of red blood cells (RBCs) through the production of a protein called erythropoietin (EPO). Produce an active form of vitamin D that promotes growth, keeping the bones healthy and strong. Balances the levels of calcium and phosphorous in the body which is crucial for heart health. Thus, they perform vital and complex functions to keep the body in good health. When the kidneys are damaged by disease, they also influence other organs. Kidney problems can range from a minor urinary tract infection to progressive kidney failure. A creatinine blood test greater than 1.2 for women and 1.4 for men. Polyuria, particularly at night; dysuria (pain/discomfort during urination), puffiness around eyes, swelling of hands and feet – especially in children. ACR (Albumin-to-creatinine ratio) If kidneys aren’t working well, protein ends up in the urine. Protein in the urine may mean that your kidneys are not filtering blood well enough. ACR detects this protein—an early sign of kidney damage. 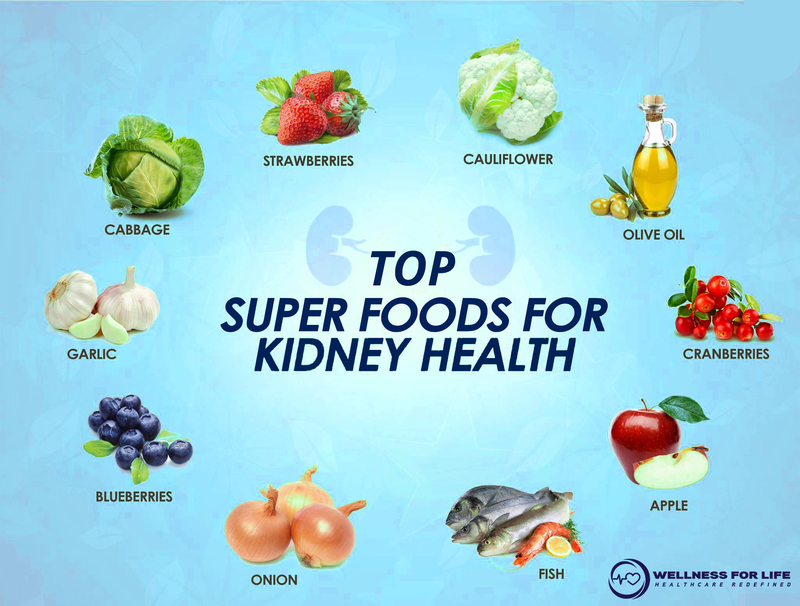 Three positive results over three months or more is a sign of kidney disease. A creatinine blood test greater than 1.2 for women and 1.4 for men. eGFR (Estimated Glomerular Filtration Rate) blood will be tested for a waste product called creatinine. Creatinine comes from muscle tissue. This measures how well kidneys filter wastes out of the blood. A filtration rate (GFR) less than 60 indicates kidney disorder. Glomerulonephritis is a disease that causes inflammation of the kidney’s tiny filtering units called glomeruli. Polycystic kidney disease is the most common inherited kidney disease. Kidney stones are a common kidney condition which obstructs urine leaving the kidney which can cause further damage to the kidneys if they are not treated. Urinary tract infections occur when bacteria enter the urinary tract and cause symptoms such as pain and/or burning during urination and polyuria (frequent need to urinate). Congenital diseases such as Goodpasture’s Syndrome and Reflux Disorder may also affect the kidneys. Anorexia, constipation, fatigue, nausea, poor appetite, weight loss, anemia (a low blood count), tiredness and specific types of pain (cramps, headache, and joint pains) are identified as most prevalent. Other symptoms include anxiety and depression, pruritus (severe itching of the skin), Restless Legs Syndrome, swelling of feet and ankles and sleep disturbance. Can kidney disease be treated successfully? Many types of kidney diseases can be treated successfully. Careful regulation of diseases like diabetes and high blood pressure can help to prevent kidney disease/ slow its progression. Kidney stones and urinary tract infections often can be treated successfully. When these diseases progress to chronic nephrosis, dialysis (Hemodialysis or Peritoneal Dialysis) or kidney transplantation may be required. Changes in diet and other lifestyle modification during the treatment helps to slow the progression of these diseases. Several ongoing studies are trying to find more effective treatment for these diseases. Protein: Restrict protein to only as much as needed by your body. Ideal protein intake is around one-half gram of protein per pound of lean body mass. Foods that are high in protein like red meat, poultry (chicken and turkey), fish, eggs, and dairy must be limited in the diet. Phosphorous: Your kidneys at this time are incapable of clearing the extra phosphorus that builds up in your blood. This might weaken bones and cause them to break easily. Avoid whole-grain bread, dietary fiber cereals and oatmeal, nuts and sunflower seeds and dark-colored colas. Sodium and Fluids: Limit your sodium intake to 1500 mg each day, if you suffer from hypertension or have extra fluid in your body. Avoid processed meats, crackers or other salty snacks, canned soups and frozen dinners, pickled foods which are high in sodium. Limiting sodium will also help you to cut down on your fluid intake. As damaged kidneys do not get rid of extra fluid effectively it may lead to swelling of the body and fluid build up in your lungs. Potassium: If you have kidney disease, you may need to limit how much potassium you take, depending on the stage of your kidney disease. Avoid eating high potassium foods such as avocados, bananas, few citrus fruits (melons and oranges) prunes and raisins, artichokes, winter squash, spinach, potatoes and tomatoes, fiber products and protein bars (granola), beans (baked, black, pinto, etc. ), brown or wild rice. Treatment with hemodialysis can be performed at a dialysis unit or at home. Hemodialysis treatments are usually performed three times a week. Peritoneal dialysis generally is done at home on a daily basis. Your doctor can explain the different treatment options and help you make the best treatment choices. There has also been increasing success with kidney transplantation, either from a living donor – who is often a family member or close friend — or a deceased (cadaver) donor. Significant renal dysfunction might be present even when serum creatinine is normal or only slightly abnormal. Renal function declines progressively once creatinine clearance falls by about 25% of normal, but symptoms are often not apparent until renal failure is advanced. The baseline rate of urinary protein excretion is the best single predictor of disease progression. The prevalence of common cardiovascular risk factors is high in chronic renal disease; early identification and effective control of these risk factors is important to improve outcomes. Cardiovascular disease accounts for 40% of all deaths in chronic renal disease. Potentially reversible causes should be pursued when renal function suddenly declines. Irreversible but modifiable complications – anemia, cardiovascular disease (accounts for 40% of all deaths in CKD), metabolic bone disease, malnutrition, begin early in the course of renal failure.